• Additional Photos for Old Jones Rd. & Freeman Farm Rd. I-85 visibility. Across from BMW. Property has been recently surveyed. A copy of this survey is in the Contract Package located under the Documents link above. Be sure to watch the property video for more information. 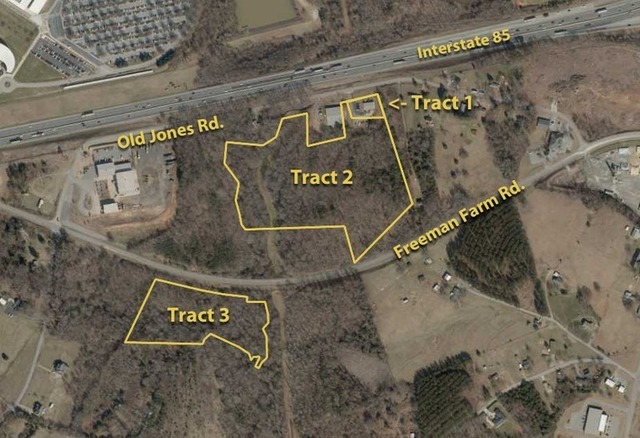 This tract is .56± acres with a 2400± sq. ft. commercial building. The 60'x40' building is divided into 2 sections—1/2 is a garage that is rented month-to-month and the other 1/2 is office that is currently vacant. The septic tank drain field may partially encroach on the 14± acre tract. This tract has I-85 visibility across from BMW. Property is located in Spartanburg County. This tract is 14.11± acres. It adjoins the commercial building property listed above. There is a CPW sewer line easement on the property. Access to the property is on Old Jones Rd. This tract has I-85 visibility across from BMW. Property is located in the city of Greer. It is currently zoned RM-2 Multifamily. This tract is 6.33± acres. It is located on Freeman Farm Rd. A portion of the property is in the floodplain. This tract is located in Spartanburg County. Gallery: Additional Photos for Old Jones Rd. & Freeman Farm Rd.